Among the hordes of gadget-lovers packed into IFA 2016, audio giant Harman has released a raft of new products across its popular sub-brands: JBL, Harman Kardon and AKG. 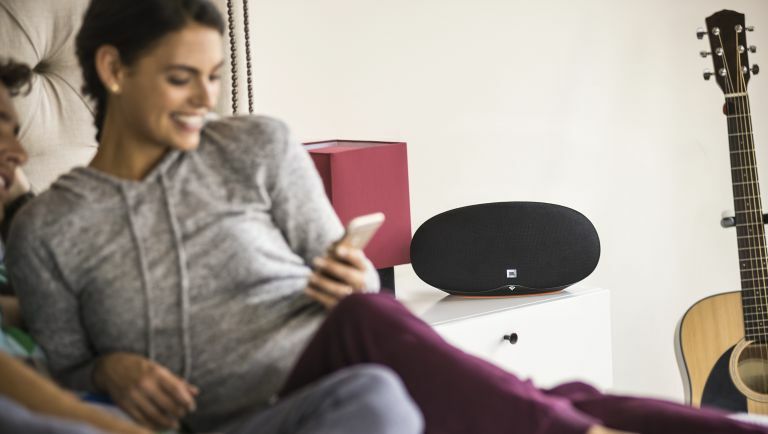 JBL, perhaps most famous for its stylish Bluetooth speakers and sporty headphones (but also a major player in high-end speakers) has had its range bolstered with a host new products, and some funky updates to its range of portable speakers. First up is the JBL Playlist. Billed as a smart Hi-Fi home speaker, this nifty lozenge has Google Cast built-in (working over Wi-Fi) so you can easily stream your music from the likes of Spotify (it also features Spotify Connect) without pairing via Bluetooth. It'll also do multi-room, if you buy multiple units, of course). It supports up to 24-bit/96kHz. The Playlist will cost you £150 and will be available in October. Next up is the E-Series range of headphones. With footballer Jerome Boating an ambassador, what could there be not to like? The range of headphones features five models, the E15 – a wired in-ear affair at £35; the E25BT – in-ear Bluetooth headphones for £60; the £60 on-ear wired 40mm driver E35; the E45BTs – an £80 pair of Bluetooth on-ears; and the E55BT – at £100 the top-of-the-range and most powerful Bluetooth cans which are over-ear, feature a 50mm driver and will last up to 20 hours on a single charge. Phew, that's a lot of headphones. All will be available in October. Oh, and there's more headphones! The JBL Contour is Harman's newest wireless sports headphones, featuring Bluetooth and a new 'Dual Lock' design which supposedly guarantees a secure fit and that they don't fall out of your ears during vigorous activity. They are also sweat proof, have a 5.8mm driver and a highly-reflective cable. They'll cost you £80, and are available in black, blue, red and teal from September. Stepping away from the headphones, JBL has also announced a new soundbar with wireless subwoofer. The JBL SB450 claims to work seamlessly with 4K displays and will deliver 'theatre-quality sound and music using Harman Display Surround sound and Dolby Digital decoding'. The 2.1, 200W affair can connect to multiple devices thanks to its three HDMI inputs, whilst the one ARC output slots into the back of your telly box. Costing £499, it's available from October. AKG, a brand synonymous with top-quality headphones, sees one update at IFA this year – in the form of the AKG N40 in-ear headphones. First up, they look beautiful – premium-quality engineering and a lovely stainless steel finish. They're also High-Res Audio-certified (by the Japan Audio Society no less) and have three sound filters enable customised sound, letting the user fine-tune their listening experience according to personal taste. Customisable options include increased bass, linear sound and boosting the song's highs. The N40s feature a hybrid driver solution – a combination of balanced armature driver and dynamic driver. And come complete with two sets of detachable cables, with/without remote/mic, carrying pouch, four sets of ear tips, flight adaptor and cleaning tool. They'll cost you £350 and are available right about now. Iconic brand Harman Kardon also sees a few new products. The most interesting of which is definitely the HK Omni+ multi-room system. This is a range of five speakers, pitched against the likes of Sonos and Heos, offering a complete home audio system. All support 24-bit/192kHz high-res audio, Google Cast, Spotify Connect and Bluetooth. There's the Omni 10+ (£229); Omni 20+ (£299); Omni 50+ (£399). Coming in Spring 2017 there's also a soundbar (Omni Bar+, TBC) and the Omni Adapt+, an HD Wireless Audio Adaptor. All support 802.11ac 2.4G and 5GHz high speed networks. There's also a new, redesigned Harman Kardon Controller App for iOS and Android smartphones and tablets which 'provides a significantly optimised interface that makes setting up the system and streaming music easier than ever'. Michael Mauser, EVP Harman and President of Lifestyle Division at Harman told us. “The Harman Kardon Omni+ line is unique in its true HD sound quality, versatility and functionality. Customers want to stream from many different sources, control their speakers from their phone or tablet and have one system to meet all of their needs. Whether they want one speaker or five, this Harman Kardon home audio system provides the best in wireless HD sound quality and access to all the content they care about.” The Omni+ range (for the most part) is available this Autumn. There a couple of other HK updates coming out of IFA. Firstly, the Onyx Mini, a typically Harman Kardon designed orb-like wireless speaker with a 10-hour battery life and the ability to connect up to three smart devices. You can also connect two of them together for true stereo. Price is TBC, and it's available from October in black, white, burgundy, blue and grey. Finally, there's the SB20, Harman Kardon's latest compact soundbar. Features include a simple plug-and-play HDMI interface, Bluetooth and auto volume functionality which keeps every channel and commercial at the same volume level when skipping through channels or being interrupted by TV ads. It costs £330 and is available this Autumn.